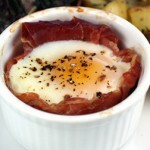 This is one of those great breakfast dishes that is really perfect most anytime of day or night. Need to feed a crowd at brunch? You bet. Want a simple, yet satisfying lunch? This is it. Need a late-night nosh after an evening of carousing? This will hit the spot. “Gallina de Madre” (‘Mother Hen’ Toast) is from the new Tyler Florence cookbook, “Tyler Florence Family Meal” (Rodale). Marin County resident and chef-owner of Wayfare Tavern in San Francisco, Florence learned how to make this dish on a visit to Barcelona. It takes ham and eggs to a whole ‘nother level. 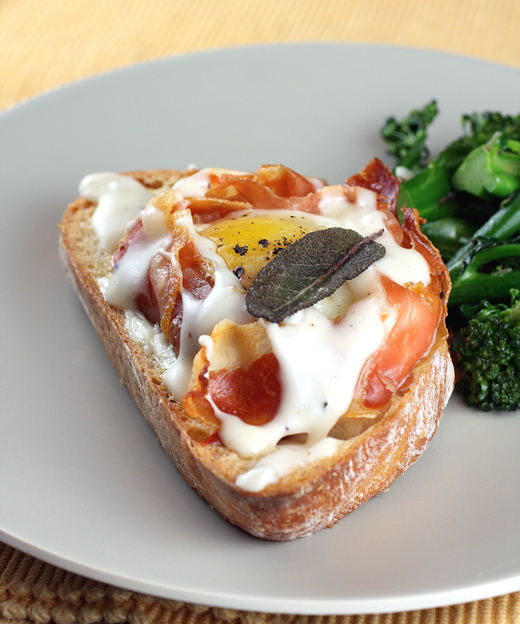 Imagine biting into a toasted, thick slice of country bread topped with slices of sweet-salty Serrano ham, a sunny side up egg and a drizzle of thick, creamy Manchego cheese bechamel sauce spiked with horseradish and nutmeg. If that doesn’t perk you up, I don’t know what will. You can easily make a big pan full of these at once to feed a lot of people. This straightforward recipe has only one tricky part: Cracking an egg on top of each toast. Florence instructs to form one slice of ham into a nest shape on each toast. Maybe because my ham slices were on the small side, but I found that it took at least two slices to do the job. You need to take care to really cup the ham well or else when you attempt to break the egg into it, the egg will run out all over the bread and into the baking pan. And believe me, you don’t want that. Once you have the egg centered inside the ham nest, place in the oven and bake until the white is set but the yolk is still runny. Before serving, top each with a fried sage leaf. 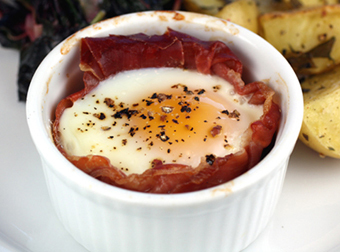 Ham and eggs have never looked so good. Contest: One lucky Food Gal reader will win a copy of Florence’s new cookbook, “Tyler Florence Family Meal,” which includes recipes he makes for his own family, as well as chef colleagues. Contest is open only to those in the continental United States. Deadline to enter is midnight PST Nov. 20. Winner will be announced on Nov. 22. Just tell me what you would most want Tyler Florence to teach you if he came to your house for a day. (And ahem, I know he’s a hottie, but let’s keep this G-rated, if you get my drift. LOL) The best answer wins the book. Make the manchego bechamel: Melt butter in a saucepan over medium heat. Add flour and cook, whisking constantly, for 2 to 3 minutes; do not allow mixture to take on any color. Gradually whisk in milk and continue to cook, whisking, until mixture thickens and comes to a boil. Add cheese and stir for another minute until it is completely melted. Stir in horseradish and nutmeg, season with salt and pepper, and keep warm while you prepare eggs. Preheat oven to 400 degrees. Arrange bread on a rimmed baking sheet and drizzle with olive oil. Season with salt and pepper. Toast in the oven until barely golden, about 10 minutes. Arrange 1 or 2 slices of ham on each toast slice, forming it into a nest shape with edges high enough to keep the egg from spilling out. Carefully break egg into each nest and sprinkle with salt and pepper. Return baking sheet to oven and bake until eggs are set but yolks are still slightly runny, about 10 minutes. While eggs bake, heat 1/2 inch of olive oil in a small skillet over medium-high heat. Add sage leaves and fry until crisp and dark, about 2 minutes. Drain on paper towels. Transfer an egg toast to each plate and spoon some of the Manchego bechamel over each. Garnish with fried sage leaf. That toast is terrific! It must taste soooo good. Looks like a wonderful dish! If Tyler Florence came to my house, I would want him to teach me how to make that brunch dish and others!! He is so talented and I would be so grateful to have his book. That breakfast has me drooling. If I had the opportunity, I’d ask Tyler to give me suggestions on recipes or dishes that will allow me to include the kids help (without driving me crazy). Can you be taught the art of improvisation? I’m the kind of gal that follows the recipe to the ‘T’… I’d love to know when/what I can substitute without ruining my dish! I’d like to learn the surefire way to fry a chicken. I bet he has a great method that works every time. I love the name of this toast, truly synonymous to its namesake.I bet you had to make seconds!!! 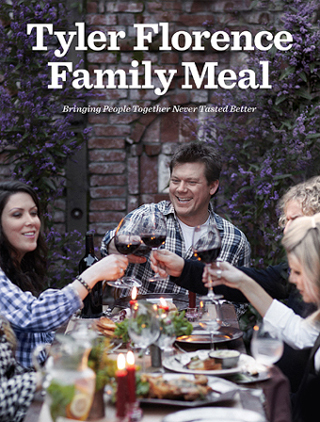 Tyler Florence does an incredible job of updating traditional family meals using simple, organic ingredients. If I had the opportunity to host Tyler at my home, I would love to learn how to make his buttermilk fried chicken. It’s divine! I haven’t had breakfast yet so this is making me super hungry…lol. If Tyler Florence came over for the day I would want him to share with me his butchering and knife skills. As primal cuts of meat and cow, pig and goat shares become more popular and accessible for the at-home cook, butchering is a skill that I would love to acquire for 2011. New Years Resolution with Tyler Florence: mastering butchering skills and knife techniques. This sounds silly but I’d really like to know how Tyler keeps the bottoms of all his pots so clean! Funny that you post this as I’m still recovering (in a good way) from dinner at Wayfare Tavern last night! So many amazing dishes! I would love to learn from Tyler how to come up with these “little things: he does to make a standard into OMG dish. For example, last night we had a salad but on the bottom of the dish they had zested lemons…it was a great little surprise that we couldn’t figure out at first! Fried Chicken…AMAZING! The little touch…topped with fried sage and thyme that we gobbled up just like the chicken! i would love to just sit down and chat with tyler about what inspires him, and what his favorite ingredients are. Eggs and toast on another level indeed! The bechamel with manchego sounds fantastic. The cookbook sounds great, and so does that recipe. Yum – manchego! If I could ask Tyler one thing it would be for any secrets/tips on adding lots of flavor to dishes without calories. Any special vinegars, herbs or spices he’s partial to? With juggling so many things, does he ever get tired? If I had Tyler in my clutches for a day, I’d have him step into my kitchen and help me brainstorm a major remodel, suggestions for a stove top that would work with the constraints we have, how to organize the cupboards more effectively. Where to store things. And if he had any time leftover, I’d like some advice on knives and some lessons in proper knife technique. If I had Tyler for a day, I would take him up to the mountains, stream fishing for the day, and then have him show me how he would cook our catch of the day. If he didn’t like to fish, then I would have him teach me how to spread butter on an aspirin. That would be just fine with me. If I had Tyler for a day, I’d ask him to teach me the ultimate meal to make my boyfriend happy since he grew up a meat and potatoes kind of guy and I’m a big veggie lover and mostly eat seafood. Horseradish, manchego, nutmeg? Now this is interesting! May need to test out a tweaked version based on what’s on hand. Not sure if Tyler makes a lot of pies, but it would be awesome to see his pie crust making technique. It’s the season pies! Sweet and savory of course. If Tyler Florence came to my house I’d like for him to show me how to make bread, a good roast chicken, & pie. That would take all day right? Then have him sit & eat with us so we could talk to him about his career & his new Wayfare Tavern restaurant. Oh lord I love tyler florence, this looks absolutely incredible, possibly my perfect brunch food..
Tyler made a chicken fried steak meal on his TV show once, I would live a live demo as I kinda have a “fear of frying” AND chicken fried steak and biscuits, dear lord is there anything better in the world? Yum… I love breakfast, definitely my favorite meal of the day. Your breakfast toastie looks mouth watering!! I finally made it to Tyler’s restaurant to celebrate my birthday this year. The man can definitely cook! Everything was delish! If I had Tyler at my house, I’d ask him for tips and tricks on how to manage the timing and serving of a large family gathering. I want to learn how to prepare and manage the meal so that all the food is hot when served (and not overcooked), all the food is beautifully presented (verus thrown on a platter and rushed to the table) and most importantly ensure that everything is tasty as well. Everything we ate at Wayfare Tavern was perfect. It is so hard to choose! I’d love to learn how he gave such depth of flavor to his short ribs… no, his beet salad… no, I’ve got it! It has to be the popovers! Wayfare Tavern has the best popovers I’ve ever tasted. I seem to be at a loss on those days when I haven’t had a chance to go to the grocery for fresh fish or poultry. I would ask Tyler for tips on how to cook from the pantry. What can I make that is nutritious and delicious from just those ingredients that I always have on hand on my shelves and in my refrigerator. If I had the chance to have Tyler Florence in my home I would want him to teach me how to make almond butter and his mac n’ cheese. The first time I went to his restaurant, he described how we did the almond butter to me (out of the blue) but I was in too much shock to really hear! It sounded so “basic” and loved the fact he kept asking my friend and I along the way how we liked everything. I agree with Heather’s wish: tips on selecting and managing a fleet of dishes that will end up finished at essentially the same time (or won’t matter). I always seem to have one dish that takes too long to prepare or reduce down or cook to temperature, leaving some fols anxious to get started and me looking more haphazard than I think I am. If there’s extra time, I’d love to have him teach me his tricks of the trade for making luscious biscuits and yeast rolls. Recipes I’ve tried are not nearly as fine as I enjoy in restaurants. Contest is now closed. Come back Monday to see who won.